Denver police detectives spent Thursday evening interviewing cheerleaders at a local high school as part of an investigation into footage of a coach forcing screaming girls into painful splits as it emerged the same coach was fired from another Colorado school for the same conduct. Four of the East High School cheerleaders also met with a medical examiner on Thursday evening to assess injuries sustained during their training sessions with coach Ozell Williams, according to a parent. 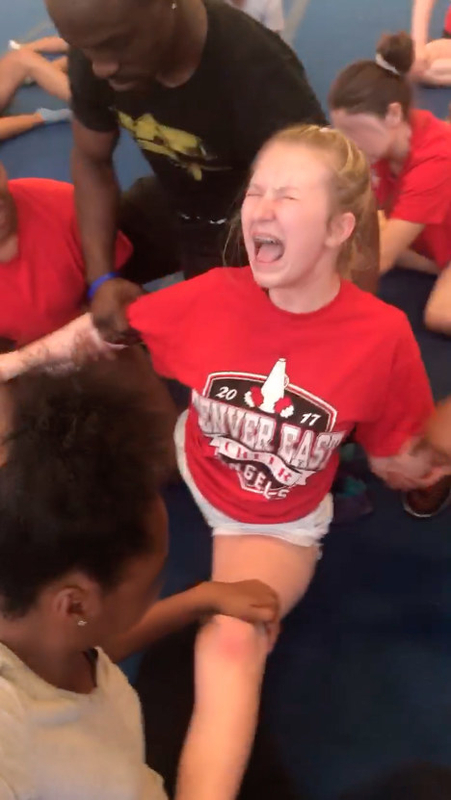 Footage emerged Wednesday of one of the girls, 13-year-old Ally Wakefield, screaming in agony as Williams and her fellow cheerleaders held her in the splits position during a June 6 training session. BuzzFeed News has also viewed videos of Williams performing the same forced split on seven other girls at the same training session, as the cheerleaders scream, cry, and swear in pain. Wakefield and her mother, Kirsten, told BuzzFeed News on Friday she sustained a torn ligament, a ripped muscle, and a possible pulled hamstring because of the incident. Kirsten Wakefield said her daughter struggled to walk after the forced split and has been seeing a physical therapist. “She couldn't walk for a couple of days. She was limping and had to borrow my husband's old crutches,” Kirsten said. Six members of the 24-girl squad have now left the cheerleading team, she added. Coach Williams, assistant coach Mariah Cladis, Principal Andy Mendelsberg, Assistant Principal Lisa Porter, and Denver Public Schools deputy general counsel Michael Hickman have been placed on leave as district officials investigate the incident. Before he joined East High, Williams was fired from a contract position at Boulder High School in 2016 after he was seen using the forced split technique on students there, an official told BuzzFeed News. “His services were discontinued when an assistant coach observed him using the technique showed in the [East High] video with students at Boulder High School,” said Randy Barber, Boulder High's director of communications. Boulder High Principal James Hill wrote to parents on Thursday, saying his school was also working with law enforcement and urged any parents “with information” to contact officials. “Please know that we believe this behavior is not acceptable,” Hill wrote. Ally Wakefield, who attends Denver School of the Arts but joined East High's cheer team as her school lacks a physical education program, said the splits exercise occurred at an intense, week-long summer training camp. “[Coach Williams] told us we're gonna get our splits and it was a technique that a lot of people use and not to be scared,” Ally said. Observing her fellow cheerleaders being held down in the splits position, Ally pulled out her phone to record footage. On the way home from practice, Ally initially played down the incident, but Kirsten said she was shocked when she saw the footage of her daughter. “Why would I not be crying? I just saw videos of my daughter and her teammates being tortured and screaming bloody murder like they were being attacked,” she added. Kirsten and two other mothers of East High cheerleaders told BuzzFeed News they made repeated written and verbal complaints about Coach Williams to the school's athletics director and principal both before and after the splits footage was filmed. Mom Jenney Rockland told BuzzFeed News she observed Williams try to correct one girl's “bad attitude” by having her stand in a circle and ask her teammates to say things about her they didn't like. Parents said they believe school officials responded slowly to their concerns due to summer vacation, and said officials were keen to let Williams, who was new as a coach, find his footing. Anna Nickolay quit the team in mid June, unhappy with what her mother described as an abusive environment. Jenney Rockland's 14-year-old daughter, Shaylen Washut, has also left the team. “As soon as I saw the videos, I wouldn't let her go back to practice,” Rockland said. “I love East High…but what happened this summer was an utter failure and it definitely highlighted a major problem in the athletic department,” Rockland said. Alex Renteria, media relations manager for Denver Public Schools, said she could not comment on the ongoing investigation into East High officials. She said she expected an update on the probe next week. In a statement, DPS Superintendent Tom Boasberg said they were cooperating with police and had spoken with the parents of every cheerleader. DPS also advised athletic directors across the district the use of forced splits was banned. “Challenging our students should never compromise their health and safety, or their personal consent,” the representatives said in a statement. “DPS does not and will not tolerate athletic or school cultures or practices that place our students in danger. The American Association of Cheerleading Coaches and Administrations also said they do not condone Williams' actions. After initially being unwilling to give up her beloved cheerleading, Ally Wakefield left the cheer team about two weeks ago. She said she cringes now when she watches the footage of her being forced to do the splits by her coach.